Hong Kong, April 9th 2019 – Dropsafe, a global provider of dropped objects prevention technology for the energy and resources markets, has found that businesses in Oil and Gas (O&G), Marine, Mining, Power Generation and Construction may be exposing themselves to significant unseen long-term costs in their procurement of health and safety equipment. Indeed, in the absence of a clear benchmark for assessing the quality and longevity of the solutions available, many firms on- and offshore have adopted a short-term focus that may ultimately affect safe and successful operation as the industry sees an upturn. 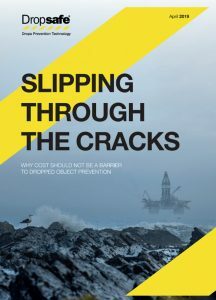 Dropsafe has today launched Slipping Through The Cracks: Why cost should not be a barrier to dropped object prevention. This new whitepaper uses one form of essential Dropped Object prevention technology – the safety barrier – as a case study for how short-term equipment and installation costs for safety products may be far outweighed by long-term maintenance and reinstallation expenditure. Critically, it provides a transparent assessment of how the leading barrier solutions in the market stack up against each other in terms of upfront cost, quality and long-term maintenance requirements. Dropped Objects, defined by DROPS as any material or object of any mass or density which falls from its previous position, pose a prominent, but under reported risk to the safety of personnel, and the financial and reputational standing of firms in a number of high risk industries. In 2017, IMCA reported that Dropped Objects constitute one of the top five causes of Lost Time Injuries offshore, but quality and consistency of incident reporting remains an obstacle to understanding the true scale of the threat. Dropsafe highlights that this lack of understanding is paralleled by a shortfall in clear advice and guidance for Dropped Objects prevention. While there are moves towards standardization of key technologies such as safety nets and barriers via schemes such as the ABS DOPP+ programme, HSE decision makers still lack a clear point of comparison between the products available. Barrier systems are now commonly installed across on- and offshore industrial sites, attaching to guardrailing upon elevated walkways, stairways and access ways of either permanent or temporary structures to prevent loose items falling from height. Although this is a straightforward concept, there is a wide range of solutions on offer – ranging from flexible mesh netting to versatile plastic barrier systems – not all of which constitute a suitable long-term investment. Indeed, Dropsafe finds that barrier solutions that are deemed to be most cost-effective in the short-term may incur the highest long-term costs. Flexible mesh netting, for instance, has a very low upfront cost, but requires routine maintenance and full replacement on a regular basis, leading to a significant long-term financial impact if deployed for a period of five years or more. Likewise, welded metal solutions are vulnerable to corrosion, and their installation necessitates hot works, which can lead to significant downtime in industries dealing with hydrocarbons. By contrast, the most versatile and robust products on the market, such as the Dropsafe Barrier, may have a higher upfront cost, but with extensive manufacturer warranties in place and minimal maintenance required over their lifetime, ultimately present a stronger investment case. “Barrier products provide a striking example of how installation of HSE equipment must be seen as a long-term investment, rather than a one-off solution to meet an immediate need,” said Mike Rice, Commercial Director, Dropsafe. To find out more, click here to download the full Slipping Through The Cracks whitepaper.